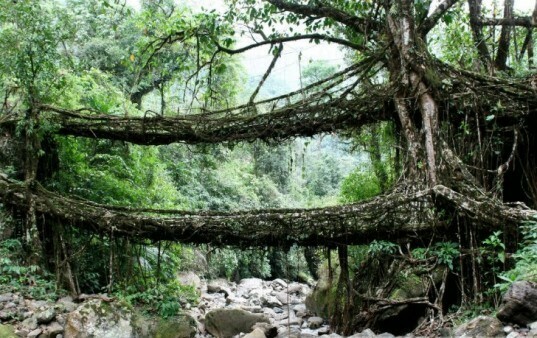 In the forests of Meghalaya, India, the War-Khasis people have discovered a patient way of crossing the many rivers of their wet region. By guiding the roots of an abundant species of rubber tree, they were able to create a living system of bridges that are in some cases over one hundred feet long and can support the weight of 50 people! This graceful solution came from a people who saw a problem and solved it using their surrounding environment. The roots are woven and guided in hollowed out betel nut trunks until they reach and grab onto the opposite banks. Over time these root systems become strong enough to support the daily movement of people across the rivers. The bridges are alive and grow stronger with time, repairing themselves and solidifying their users’ relationships with the earth. We hope you enjoy this inspiring glimpse at a solution that is truly in harmony with nature.